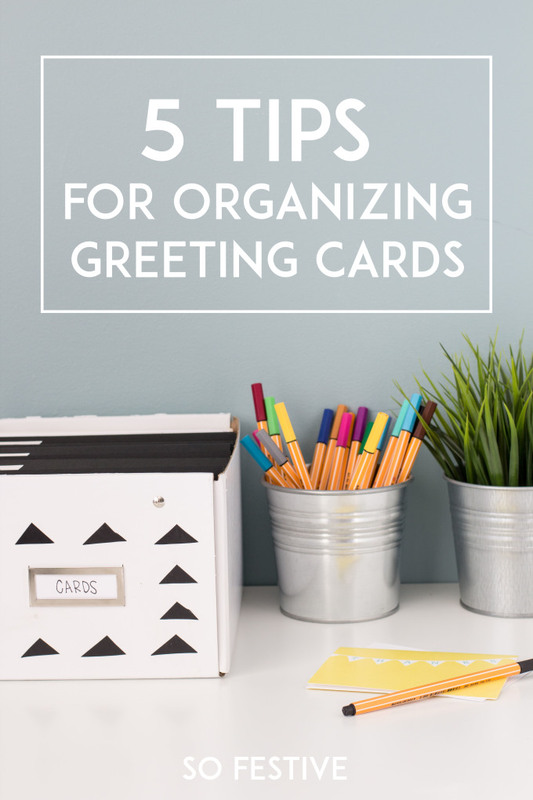 5 Tips for Organizing Greeting Cards - So Festive! 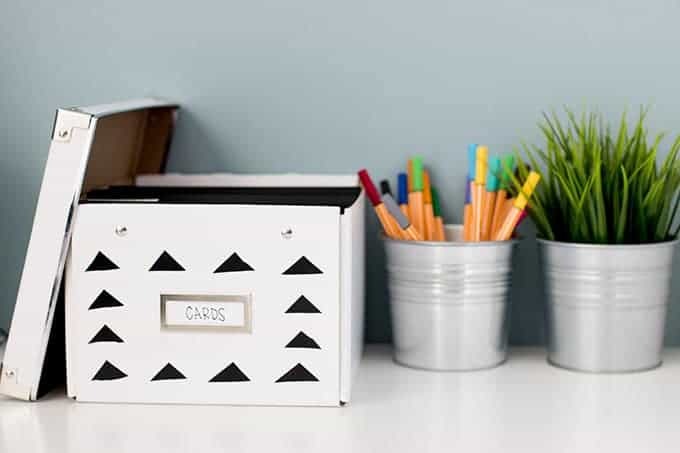 Organize your greeting cards with these 5 practical tips! One of my goals this year is to send more greeting cards. Like real mail. I’m all about prevent dying arts from dying and sending cards is one of them, in my opinion. Sure an email or a text is really, really convenient. But every time I get real mail, I get a big ole’ smile on my face and it makes me happy all day long. I’ve noticed that when my cards are organized and accessible, I send mail more often. So here are my 5 tips to organizing greeting cards. Maybe they’ll be useful for you, too! 1. Invest in a cheap box to keep all your greeting cards in. I picked up this white box at Ikea when I was doing our Office/Craft Room Makeover and it has been a great investment. Well, if you can even call it an investment since it was only a few dollars. 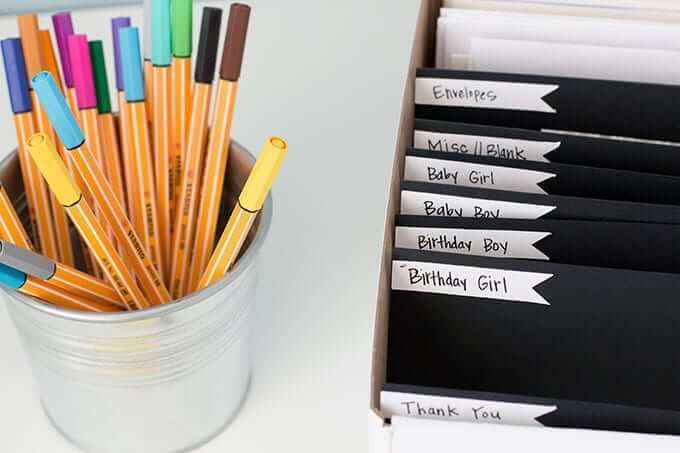 I sure love cheap ways to organize. I think it’s a great size. Not to bulky, but big enough to keep a healthy stash of greeting cards in. 2. Make a section for each of your most-used types of cards. Technically, this step is totally optional, but if you want to be able to find cards fast (or send your husband or roommate to find a card for you), this will ensure you will get a birthday card instead of a baby card. 🙂 And save you some embarrassment. Tip: If you make your own cards, stock up on blank envelopes using a craft store coupon or buy a big box of envelopes from Amazon here. To make section dividers, I just used black card stock, cut 5.5″x 8″. I added some white paper labels. Easy peasy. 3. Keep envelopes and stamps in the same greeting card box. There’s nothing worse than taking the time to write a hand-written note and then never sending it because you don’t have envelopes and stamps accessible. Keeping stamps and envelopes and even pens nearby will make writing and sending cards so much easier. Tip: Many grocery stores and even Costco sells stamps. Stock up when you’re out and about. Can we talk about one of my favorite things ever? Besides these pens that I love writing all my cards with, I absolutely LOVE our return mailing address stamp. And so do my kids 🙂 I love that I don’t have to write our address on the back and I love how classy the stamp looks. So along with my envelopes and stamps, I also keep our return mailing address stamp in the card box. Seriously, having EVERYTHING and I mean everything all together will make sending cards easier. 4. 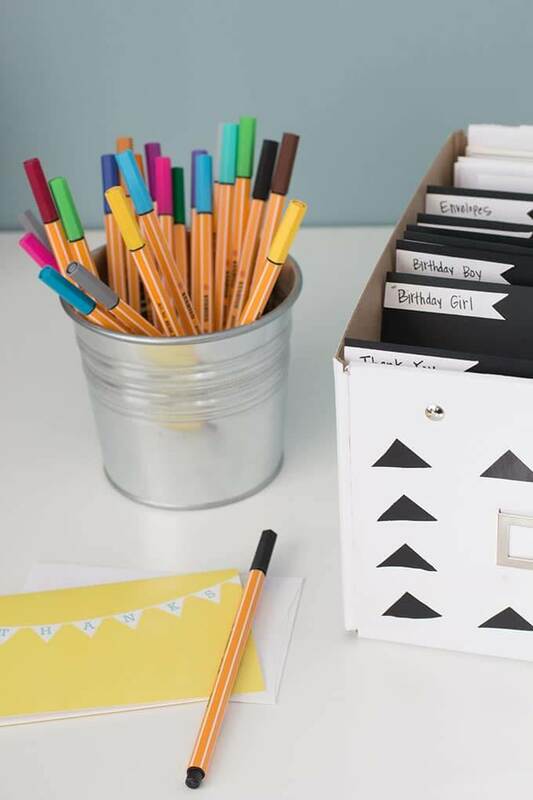 Keep your greeting card organizer in a room and place that is super accessible! Sending cards can be hard enough, so you want to take out all the complications, right? Keep the card box by your computer or in the kitchen or wherever it is that will make it easy for you to access the cards. If the box is on the very top shelf of the closet in a spare bedroom, you probably won’t be as likely to send a card. 5. Throw out cards you will never send. I finally threw out some homemade cards that I have been saving all these years. I never used them because they were ugly and always chose my cute cards over those ones. So if you have some cards that have yellowed over time or you would be embarrassed to send, throw them out! I’m all about being resourceful, but if you are never going to use it, recycle it! Only keep the cards you will actually use. How do you organize your greeting cards? I’d love to hear what I’m missing! How To Organize Your Entire Christmas Season! Thank you for all this great information about organizing my greeting cards! I really like your tip to organize the cards with tabs, so they are easy to access. I love how you mentioned it makes it easier for your husband to find the right card. I feel like it’s easy without, but I know my husband is going to appreciate this change and he won’t feel so much pressure to pick the right card for the event. Thanks! so glad you found these tips helpful!